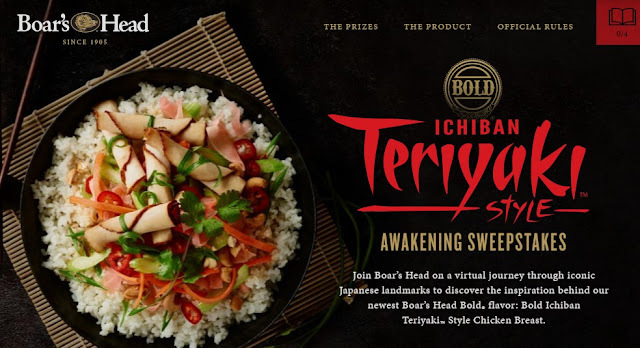 Boar's Head Bold wants you to take a journey to Japan, Ichiban Teriyaki style! Enter daily to win their instant win game and gift card prizes or a check for more than $6000 to take you to Japan! Grand Prize: The ARV of a trip for two (2) to Japan. The prize will be awarded as a check for $6,500 payable to the Grand Prize winner to purchase his/her own trip. ARV: $6,500. (1,020) Daily-Win Prizes - 34 per day during the Sweepstakes Period: (14) per day $15 AMEX Gift Card. ARV: $15.00 each. (10) per day Leeman soft-cover journals ARV: $10.00 each. (10) per day Boar’s Head “Ichiban Teriyaki” designer t-shirts. ARV: $7.30 each. (80) Social Extension Prizes (10 per each for Facebook and Twitter per week): One (1) $25 AMEX Gift Card. ARV: $25 each.